Doctor Web is a Russian IT-security solutions vendor developing Dr.Web anti-virus for businesses, government entities, and personal use. Before purchasing a license to any Doctor Web product, interested users can download the trial version to test the software to see if it is worth buying. 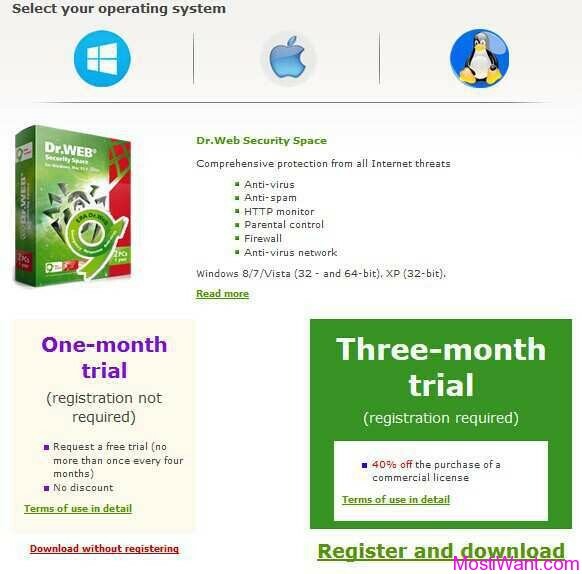 Like other security software, the official Doctor Web website usually provides free trial for one month only, but there is a promotion offer to get a free copy of Dr.Web Security Space Pro 9 that protect you for 6 months. The Licensed Dr.Web products includes Dr.Web Security Space & Dr.Web Anti-virus Pro 9 for Windows, Dr.Web Anti-virus for Mac OS X, and Dr.Web Anti-virus for Linux, as well as free protection of one mobile device running Android (Comprehensive protection), Symbian OS or Windows Mobile. Dr.Web Security Space is an advanced effective security software that offers quality protection against all sorts of increasing threats of internet such as viruses, rootkits, mail worms, hack-tools, spam, phishing attacks, infected web-pages and cyber crimes targeting children. It adds several features to Dr.Web Anti-virus such as Anti-spam, HTTP monitor and Parental control. Scanner ensures the highest rate of detection and fast scanning of autorun objects, removable data-storage devices, network and logical drives, e-mails, and files and directories (including archived files). SpIDer Guard ensures constant resource-efficient monitoring of file operations. Anti-rootkit exposes rootkits lurking in the system. SpIDer Mail monitor scans e-mails transferred via SMTP/POP3/NNTP/IMAP4. Scan encrypted SSL-connections (SMTPS/POP3S/IMAP4S). Anti-spam detects spam and other unsolicited messages in any language with next to zero false positives. Firewall is an impenetrable barrier to hackers attempting to break into your system. Parental control blocks access to websites by keywords in their URLs and protects children from exposure to objectionable web content. You can restrict access to removable data-storage devices, files and directories to prevent unauthorized access or the deletion of important information. Dr.Web Anti-virus provides basic protection of your system and data against rootkit, spyware, viruses, adware and e-mail from viruses. The software provides solution for protection On-access scan (real-time protection) and on-demand scan mode, you can also set schedule to run scanning on specific time. Dr.Web Mobile Security Suite is a complete mobile anti-virus security solution for protection of Android, Symbian OS and Windows Mobile phones that protect your precious handheld from any type of malware used by fraudsters for cybercrimes. 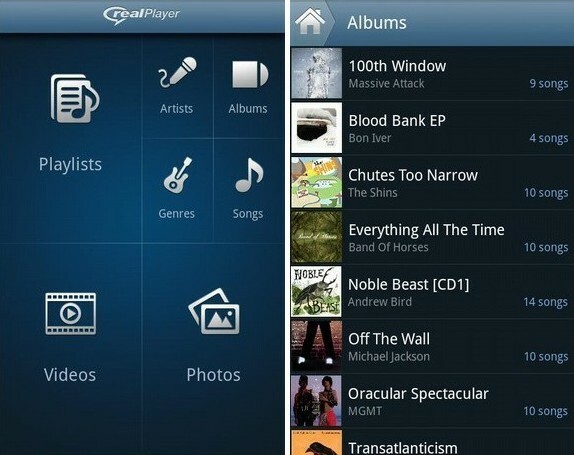 The solution should include an anti-virus, anti-spam, anti-theft and parental control (Anti-virus&Anti-spam only, for Windows Mobile & Symbian OS). As part of the promo offer by Chip.de, Doctor Web is giving everyone the opportunity to protect their PCs/Macs and mobile devices with Dr.Web products for free for 6 months. To get your free full version serial key, you just need to sent a blank email with any subject, e.g.”Free License For Dr.Web Security Space 9″, to [email protected]. You will receive an email with your free serial key in about 12 hours. Thanks to Sharemore for informing me about this promo! 1, Interested users just need to visit the promo page here, and select your operating system (Windows, Mac, or Linux). 2, Then press the “Register and download” button and follow on-screen instructions, you will get an email from <[email protected]> consisting of your confirmation link. Check it and click on the confirmation link. 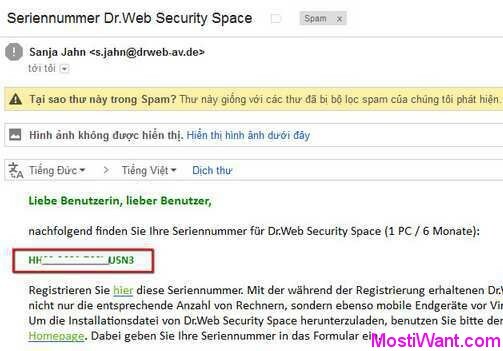 3, You will get another email from Doctor Web consisting of your free 3 months serial number for Dr.Web Security Space 9. If the license e-mail hasn’t arrived within 15 minutes after your submit your email, please check your spam, promotions or junk mail folder to locate it. 4, Follow the instructions below to download and active your Dr.Web produces. If Dr.Web is already installed in the system, right-click on its icon in the system tray and select Tools –> License Manager (if the License Manager item is not available, switch to administrative mode). In the License Manager window, click Get new license, specify the serial number and registration data. Dr.Web will automatically download the key file and install it in the correct directory. 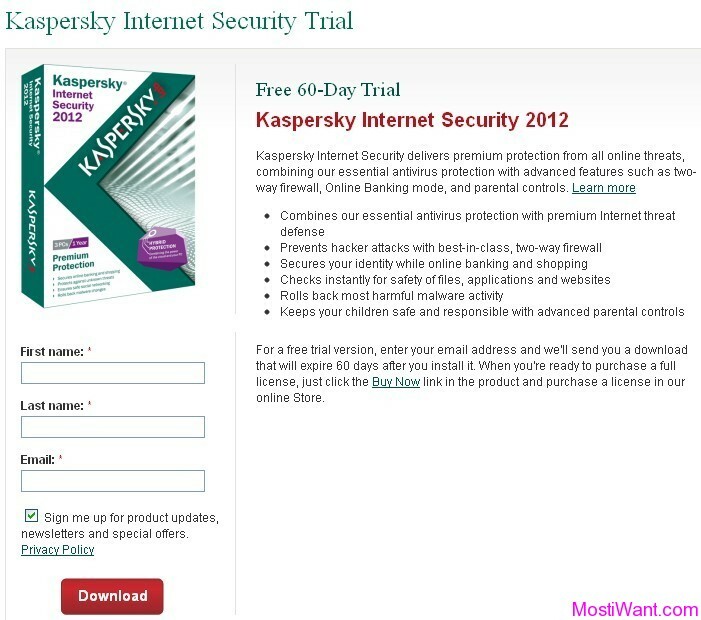 If Dr.Web is not installed on your computer, download the program distribution from Dr.web website, and run the installer. During installation enter your serial number and get the key file. Key file will be downloaded and installed in the correct directory automatically. If you want to installer Dr.Web Security Space on your mobile device, please install it on desktop and active the license first. Then download the program distribution from Dr.web website. I need this products (windows &android) keys. plz sent me…..
May I ask u where are u origin from plz ?